To determine the amount of substance in a solution of unknown concentration using various titrimetric methods. The word titration comes from the Latin word "titulus", which means inscription or title. The French word title means rank. Therefore, Titration means the determination of concentration or rank of a solution with respect to water with a pH of 7. The standard solution is usually added from a graduated vessel called a burette. The process of adding standard solution until the reaction is just complete is termed as titration and the substance to be determined is said to be titrated. The reaction must be a fast one. The change in free energy (ΔG) during the reaction must be sufficiently large for spontaneity of the reaction. There should be a way to detect the completion of the reaction. For a reaction, a stage which shows the completion of a particular reaction is known as end point. Equivalence point is a stage in which the amount of reagent added is exactly and stoichiometrically equivalent to the amount of the reacting substance in the titrated solution. The end point is detected by some physical change produced by the solution, by itself or more usually by the addition of an auxiliary reagent known as an 'indicator'. The end point and the equivalence point may not be identical. End point is usually detected only after adding a slight excess of the titrant. In many cases, the difference between these two will fall within the experimental error. It is a chemical reagent used to recognize the attainment of end point in a titration. After the reaction between the substance and the standard solution is complete, the indicator should give a clear colour change. When a titration is carried out, the free energy change for the reaction is always negative. That is, during the initial stages of the reaction between A & B, when the titrant A is added to B the following reaction takes place. The reaction of the concentration of A & B leads to the reduction of the total free energy change. If the concentrations of A & B are too low the magnitude of the total free energy change becomes so small and the use of the reaction for titration will not be feasible. The concentration or strength of solution means the amount of solute present in a given amount of the solution. The concentration may be expressed in physical or chemical units. Molarity (M): It is defined as the number of moles of the solute present in 1 litre (or 1000 mL) of the solution. A one molar solution contains 1 mole of the solute dissolved in 1 litre of the solution. Molality (m): It is defined as the number of moles of solute dissolved in 1000 g of the solvent. One molal solution contains one mole of the solute dissolved in 1000 g of the solvent. A solution containing one gram equivalent weight of the solute dissolved per litre is called a normal solution; e.g. when 40 g of NaOH are present in one litre of NaOH solution, the solution is known as normal (N) solution of NaOH. Similarly, a solution containing a fraction of gram equivalent weight of the solute dissolved per litre is known as subnormal solution. For example, a solution of NaOH containing 20 g (1/2 of g eq. wt.) of NaOH dissolved per litre is a sub-normal solution. It is written as N/2 or 0.5 N solution. Strength of solution = Amount of substance in g litre-1. Strength of solution = Amount of substance in g moles litre-1. Strength of solution = Normality × Eq. wt. of the solute = molarity × Mol. wt. of solute. Molarity = Moles of solute/Volume in litre. Number of moles = Wt.in g/Mol. wt = M × V (initial) = Volume in litres/22.4 at NTP (only for gases). Number of milli moles = Wt. in g × 1000/mol. wt. = Molarity × Volume in mL. Number of equivalents= Wt. in g/Eq. wt = x × No. of moles × Normality × Volume in litre (Where x = Mol. wt/Eq. wt). Number of mill equivalents (meq.) = Wt. in g × 1000 / Eq. wt = normality × volume in mL. Normality = x × No. of mill moles (Where x = valency or change in oxi. number). Normality formula, N1V1 = N2V2, (Where N1, N2 → Normality of titrant and titrate respectively, V1, V2 → Volume of titrant and titrate respectively). % by weight = Wt. of solvent/Wt. of solution × 100 . A solution is a homogeneous mixture of two or more components, the composition of which may be changed. The substance which is present in smaller proportion is called the solute, while the substance present in large proportion is called the solvent. It involves the estimation of a substance in solution by neutralization, precipitation, oxidation or reduction by means of another solution of accurately known strength. This solution is known as standard solution. Weight of the substance (g per litre) = Normality × gram equivalent weight of the substance. i) The reaction between the titrant and titrate must be expressed. ii) The reaction should be practically instantaneous. iii) There must be a marked change in some physical or chemical property of the solution at the end point. iv) An indicator should be available which should sharply define the end point. A pH indicator is a substance that it changes its colour in response to a chemical change. An acid-base indicator changes its colour depending on the pH (e.g., phenolphthalein). Redox indicators are also frequently used. A drop of indicator solution is added to the titration at the start; at the endpoint has been reached the colour changes. It is an instrument that measures the electrode potential of the solution. These are used for titrations based on a redox reaction; the potential of the working electrode will suddenly change as the endpoint is reached. It is a potentiometer that uses an electrode whose potential depends on the amount of H+ ion present in the solution. (It is an example of an ion-selective electrode.) This allows the pH of the solution to be measured throughout the titration. At the endpoint, there will be a sudden change in the measured pH. This method is more accurate than the indicator method and is very easily automated. The conductivity of a solution depends on the ions present in it. During many titrations, the conductivity changes significantly. (i.e., during an acid-base titration, the H+ and OH- ions react to form neutral H2O, this changes the conductivity of the solution.) The total conductance of the solution also depends on the other ions present in the solution, such as counter ions. This also depends on the mobility of each ion and on the total concentration of ions that is the ionic strength. In some reactions, the solution changes colour without any added indicator. This is often seen in redox titrations, for instance, when the different oxidation states of the product and reactant produce different colours. In this type of titration the strength of a solution is determined by its complete precipitation with a standard solution of another substance. The chemical reaction involved in acid-base titration is known as neutralisation reaction. It involves the combination of H3O+ ions with OH- ions to form water. In acid-base titrations, solutions of alkali are titrated against standard acid solutions. The estimation of an alkali solution using a standard acid solution is called acidimetry. Similarly, the estimation of an acid solution using a standard alkali solution is called alkalimetry. Ostwald, developed a theory of acid base indicators which gives an explanation for the colour change with change in pH. According to this theory, a hydrogen ion indicator is a weak organic acid or base. The undissociated molecule will have one colour and the ion formed by its dissociation will have a different colour. Let the indicator be a weak organic acid of formulae HIn. It has dissociated into H+ and In- . The unionized molecule has one colour, say colour (1), while the ion, In- has a different colour, say colour (2). Since HIn and In- have different colours, the actual colour of the indicator will dependent upon the hydrogen ion concentration [H+]. When the solution is acidic, that is the H+ ions present in excess, the indicator will show predominantly colour (1). On other hand, when the solution is alkaline, that is, when OH- ions present in excess, the H+ ions furnished by the indicator will be taken out to form undissociated water. Therefore there will be larger concentration of the ions, In-. thus the indicator will show predominantly colour (2). Some indicators can be used to determine pH because of their colour changes somewhere along the change in pH range. Some common indicators and their respective colour changes are given below. i.e., at pH value below 5, litmus is red; above 8 it is blue. Between these values, it is a mixture of two colours. Let us consider the titration of HCl and NaOH. The pH values of different stages of titration shows that, at first the pH changes very slowly and rise to only about 4. Further addition of such a small amount as 0.01 mL of the alkali raises the pH value by about 3 units to pH 7. Now the acid is completely neutralized. Further of about 0.01 mL of 0.1 M NaOH will amount to adding hydrogen ions and the pH value will jump to about 9. Thus, near the end point, there is a rapid increase of pH from about 4 to 9. An indicator is suitable only if it undergoes a change of colour at the pH near the end point. Thus the indicators like methyl orange, methyl red and phenolphthalein can show the colour change in the ph range of 4t0 10. Thus, in strong acid- strong base titrations, any one of the above indicators can be used. Let us consider the titration of acetic acid against NaOH. The titration shows the end point lies between pH 8 and 10. This is due to the hydrolysis of sodium acetate formed. Hence phenolphthalein is a suitable indicator as its pH range is 8-9.8. However, methyl orange is not suitable as its pH range is 3.1 to 4.5. Let us consider the titration ammonium hydroxide against HCl. Due to the hydrolysis of the salt, NH4Cl, formed during the reaction, the pH lies in the acid range. Thus, the pH at end point lies in the range of 6 to 4. Thus methyl orange is a suitable indicator while phenolphthalein is not suitable. A titrimetric method based on the formation of a slightly soluble precipitate is called a precipitation titration. The most important precipitation process in titrimetric analysis utilizes silver nitrate as the reagent (Argentimetric process). Many methods are utilized in determining end points of these reactions, but the most important method, the formation of a coloured precipitate will be considered here. In the titration of a neutral solution of chloride ions with silver nitrate, a small quantity of potassium chromate solution is added to serve as the indicator. At the end point the chromate ions combine with silver ions to form the sparingly soluble brick-red silver chromate. This is a case of fractional precipitation, the two sparingly soluble salts being AgCl (Ksp = 1.2 x 10-10) and Ag2CrO4 (Ksp = 1.7x10-12). AgCl is the less soluble salt and initially chloride concentration is high, hence AgCl will be precipitated. Once the chloride ions are over and with the addition of small excess of silver nitrate solution brick red colour silver chromate becomes visible. The titration should be carried out in neutral solution or in very faintly alkaline solution. i.e. within the pH range 6.5-9. Consequently the chromate ions concentration is reduced and the solubility product of silver chromate may not be exceeded. In markedly alkaline solution, silver hydroxide (Ksp = 2.3 x 108) might be precipitated. The titration can be carried out with dichlorofluorescein as the indicator. Dichlorofluorescein is an example of an adsorption indicator. Adsorption indicators have the interesting property of changing colour when they stick (adsorb) to the surface of a precipitate. During the titration the dichlorofluorescein molecules exist as negatively charged ions (anions) in solution. As the AgCl precipitate is forming, the excess Cl- ions in the solution form a layer of negative charge on the precipitate surface. As the equivalence point is reached and passed, the excess Cl- ions on the precipitate surface are replaced by excess Ag+ ions, giving the surface a positive charge. The negatively charged indicator will be attracted to the positively charged precipitate surface where it absorbs and changes colour. The suspended precipitate will have a pink tinge because of some premature displacement of chloride ion by the dichlorofluorescein ion. When the pink colour starts to persist for slightly longer periods of time, the drip rate is lowered. The end point is reached when the entire solution turns pink. It is important that the AgCl precipitate be prevented from coagulation during the titration. For this reason a small amount of dextrin is added to the solution. This type of titration depends upon the combination of ions (other than H+ and OH-) to form a soluble ion or compound as in the titration of a solution of a cyanide with AgNO3. Complexometric titrations are particularly useful for determination of a mixture of different metal ions in solution. Ethylene diamine tetra acetic acid (EDTA), is a very important reagent for complex formation titrations. EDTA has been assigned the formula II in preference to I since it has been obtained from measurements of the dissociation constants that two hydrogen atoms are probably held in the form of zwitter ions. One gram ion of the complex-forming ion H2Y2- reacts in all cases with one gram ion of the metal. EDTA forms complexes with metal ions in basic solutions. In acid-base titrations the end point is detected by a pH sensitive indicator. In the EDTA titration metal ion indicator is used to detect changes of pM. It is the negative logarithm of the free metal ion concentration, i.e., pM = - log [M2+]. 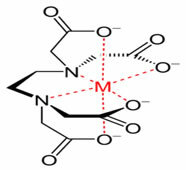 Metal ion complexes form complexes with specific metal ions. These differ in colour from the free indicator and a sudden colour change occurs at the end point. End point can be detected usually with an indicator or instrumentally by potentiometric or conductometric (electrometric) method. There are three factors that are important in determining the magnitude of break in titration curve at end point. The stability of complex formed: The greater the stability constant for complex formed, larger the charge in free metal concentration (pM) at equivalent point and more clear would be the end point. The number of steps involved in complex formation: Fewer the number of steps required in the formation of the complex, greater would be the break in titration curve at equivalent point and clearer would be the end point. Effect of pH: During a complexometric titration, the pH must be constant by use of a buffer solution. Control of pH is important since the H+ ion plays an important role in chelation. Most ligands are basic and bind to H+ ions throughout a wide range of pH. Some of these H+ ions are frequently displaced from the ligands (chelating agents) by the metal during chelate formation. Thus, stability of metal complex is pH dependent. Lower the pH of the solution, lesser would be the stability of complex (because more H+ ions are available to compete with the metal ions for ligand). Only metals that form very stable complexes can be titrated in acidic solution, and metals forming weak complexes can only be effectively titrated in alkaline solution. During an EDTA titration 2 complexes are formed: i) M-EDTA complex and ii) M-indicator complex. The metal-indicator complex must be less stable than the metal-indicator complex. Erichrome black T is a metal ion indicator. In the pH range 7-11 the dye itself has a blue colour. In this pH range addition of metallic salts produces a brilliant change in colour from blue to red. This colour change can be obtained with the metal ions. 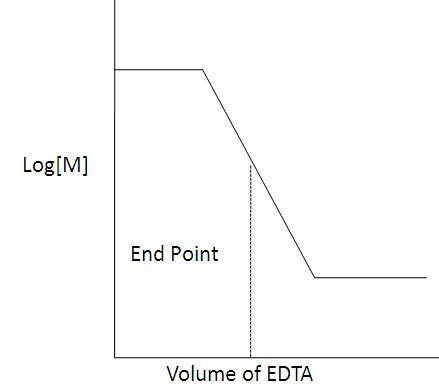 As the EDTA solution is added, the concentration of the metal ion in the solution decreases due to the formation of metal-EDTA complex. At the end point no more free metal ions are present in the solution. At this stage, the free indicator is liberated and hence the colour changes from red to blue. Complexometric titration is widely used in the medical industry because of the micro litre size sample involved. The method is efficient in research related to the biological cell. Ability to titrate the amount of ions available in a living cell. Ability to introduce ions into a cell in case of deficiencies. Complexometric titration involves the treatment of complex ions such as magnesium, calcium, copper, iron, nickel, lead and zinc with EDTA as the complexing agent. Complexometric titration is an efficient method for determining the level of hardness of water. As mentioned earlier, EDTA is a versatile chelating titrant that has been used in innumerable complexometric determinations. The versatility of EDTA can be ascribed to the different ways in which the complexometric titration can be executed. Let us learn about different ways in which we can use EDTA titrations. Direct Titration: It is the simplest and the most convenient method in which the standard solution of EDTA is slowly added to the metal ion solution till the end point is achieved. 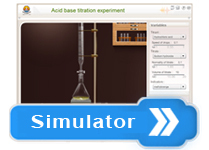 It is similar to simple acid-base titrations. For this method to be useful the formation constant must be large and the indicator must provide a very distinct colour change as mentioned earlier. Further we need standardized solution of EDTA and sometimes auxiliary complexing agents may be required. Some important elements which could be determined directly by the complexometric titration are Cu, Mn, Ca, Ba, Br, Zn, Cd, Hg, Al, Sn, Pb, Bi, Cr, Mo, Fe, Co, Ni, and Pd, etc. However, the presence of other ions may cause interference and need to be suitably handled. Back Titration: In this method, an excess of a standard solution of EDTA is added to the metal solution being determined so as to complex all the metal ions present in the solution. The excess of EDTA left after the complex formation with the metal is back titrated with a standard solution of a second metal ion. This method becomes necessary if the analyte precipitates in the absence of EDTA or reacts too slowly with EDTA, or it blocks the indicator. For example, determination of Mn is done by this method because a direct titration is not possible due to precipitation of Mn(OH)2. The excess EDTA remaining after complexation, is back titrated with a standard Zn solution using Eriochrome black T as indicator. However, one has to ensure the standard metal ion should not displace the analyte ion from their EDTA complex. Replacement Titration: When direct or back titrations do not give sharp endpoints or when there is no suitable indicator for the analyte the metal may be determined by this method. The metal to be analyzed is added to a metal-EDTA complex. The analyte ion (with higher Kf') displaces EDTA from the metal and the metal is subsequently titrated with standard EDTA. For example, in the determination of Mn an excess of Mg EDTA chelate is added to Mn solution. The Mn ions quantitatively displace Mg from Mg-EDTA solution because Mn forms a more stable complex with EDTA. The freed Mg metal is then directly titrated with a standard solution of EDTA using Eriochrome black T indicator. Ca, Pb and Hg may also be determined by this method. Indirect Titration: Certain anions that form precipitate with metal cations and do not react with EDTA can be analyzed indirectly. The anion is first precipitated with a metal cation and the precipitate is washed and boiled with an excess of disodium EDTA solution to form the metal complex. The protons from disodium EDTA are displaced by a heavy metal and titrated with sodium alkali. Therefore, this method is also called alkalimetric titration. For example, barbiturates can be determined by this method. A reaction in which one or more electrons are lost is known as oxidation and a reaction in which one or more electrons are gained is known as reduction. Accordingly, a substance which can accept one or more electrons is known as oxidizing agent and a substance which can donate one or more electrons is called reducing agent. Titrations of this type are called redox titrations. Thus, redox titrations are those involving transfer of electrons from the reducing agent to the oxidizing agent. Potassium permanganate, potassium dichromate, ceric sulphate, etc., are the common oxidizing agents used in redox titrations. Oxalic acid, Mohr’s salt and arsenious oxide are reducing agents commonly used in redox titrations. Iodine is a mild oxidizing agent. In the presence of a suitable reducing agent, it is reduced to iodine ion, I-. In addition to this, all oxidizing agents having electrode potential greater than 0.54 V can oxidize I- to I2. When iodine solution is directly used for the estimation of reducing agents, the titration is called iodimetric titration (iodimetry). The titrations involving the iodine liberated in a chemical reaction are called iodometric titration (iodometry).